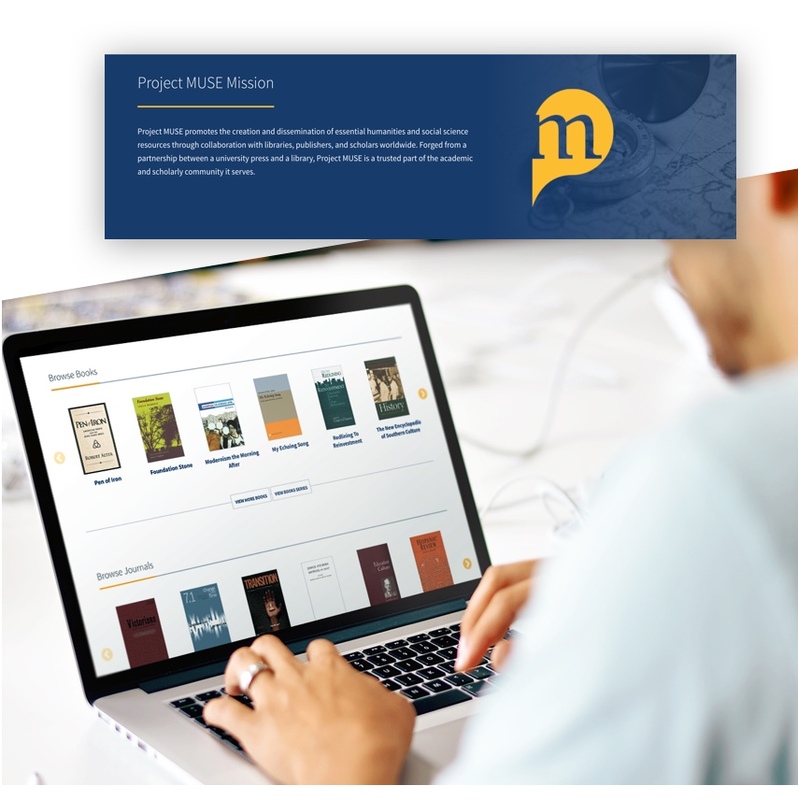 The first of its kind in scholarly humanities publishing, Project MUSE was established in 1995 through a partnership between Johns Hopkins University (JHU) Press and Milton S. Eisenhower Library at JHU. 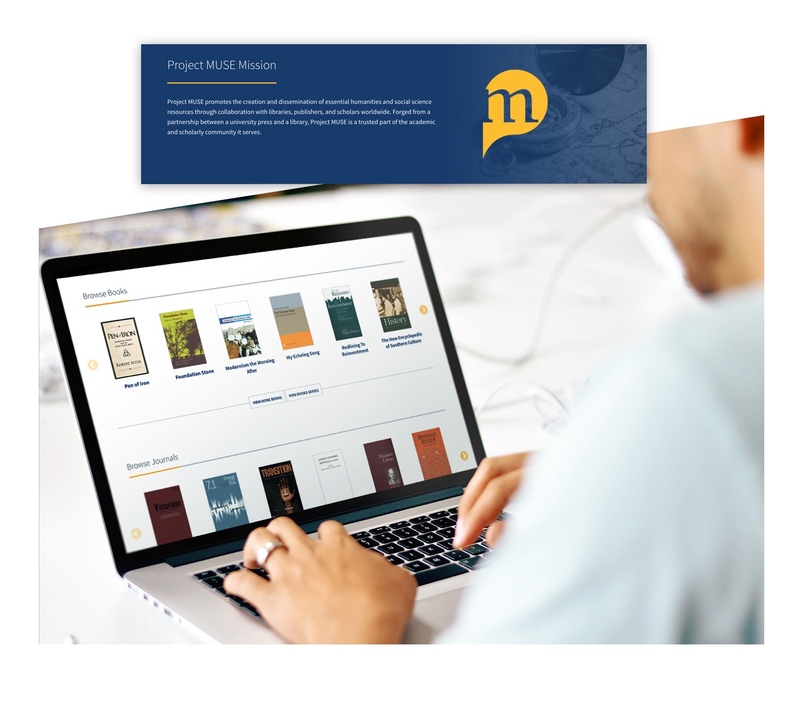 Project MUSE works with libraries, publishers, and scholars around the world as a trusted source of digital humanities and social science content for the scholarly community. 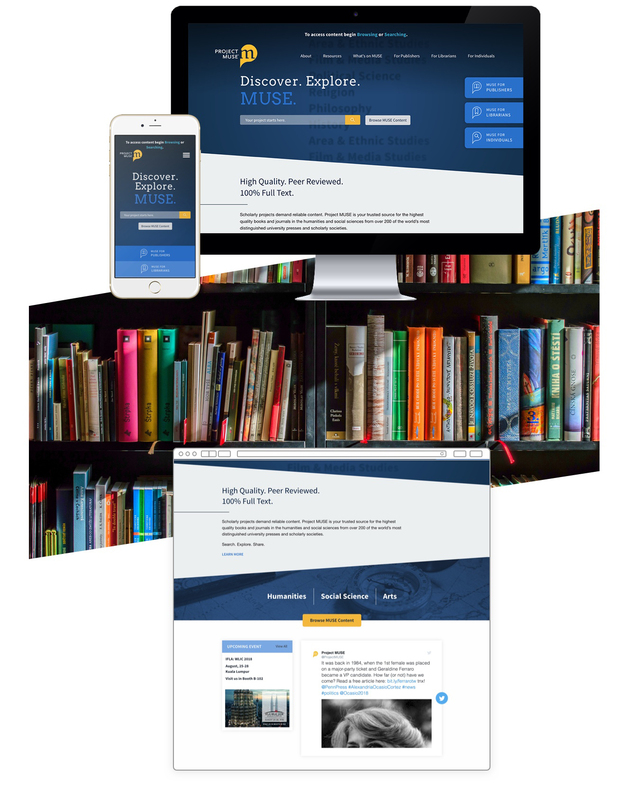 provide a design that compliments and keeps the Project MUSE brand consistent with the newly developed site for content. 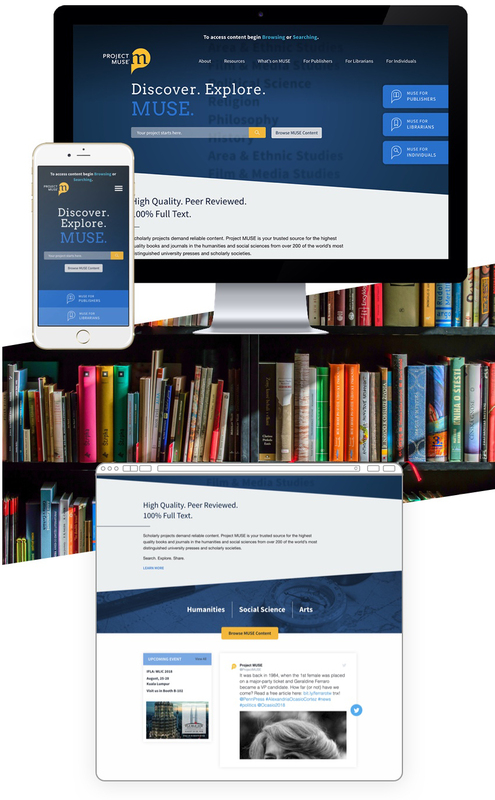 Incorporating a complete discovery process allowed the team to really see and understand aspects of the website that could be improved. Analytics and a content audit allowed us to consolidate and pare down content around audience needs. 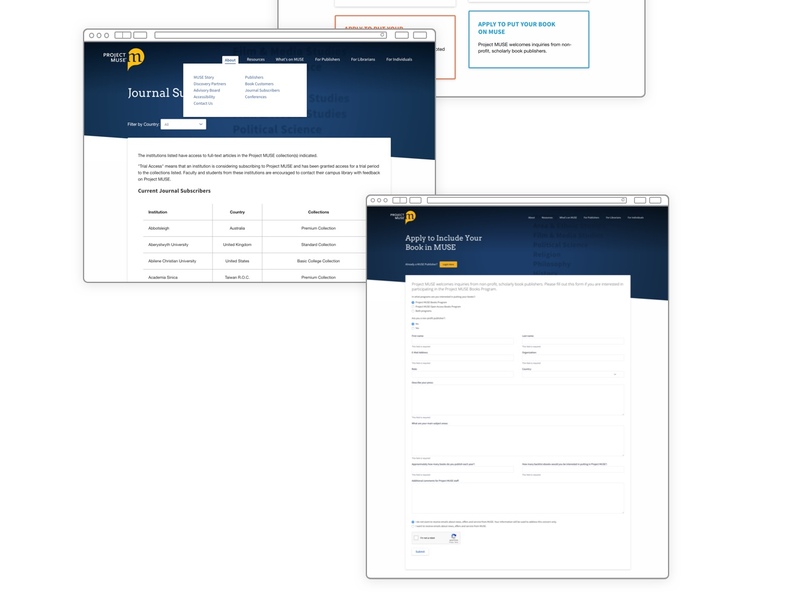 Tree testing, in particular, was extremely valuable in showing the different pathways users chose when visiting the website, which helped us make improvements to the sitemap and informed our designs. We also surveyed approximately 300 Project MUSE publishers and librarians to inform our creative decisions throughout the process. 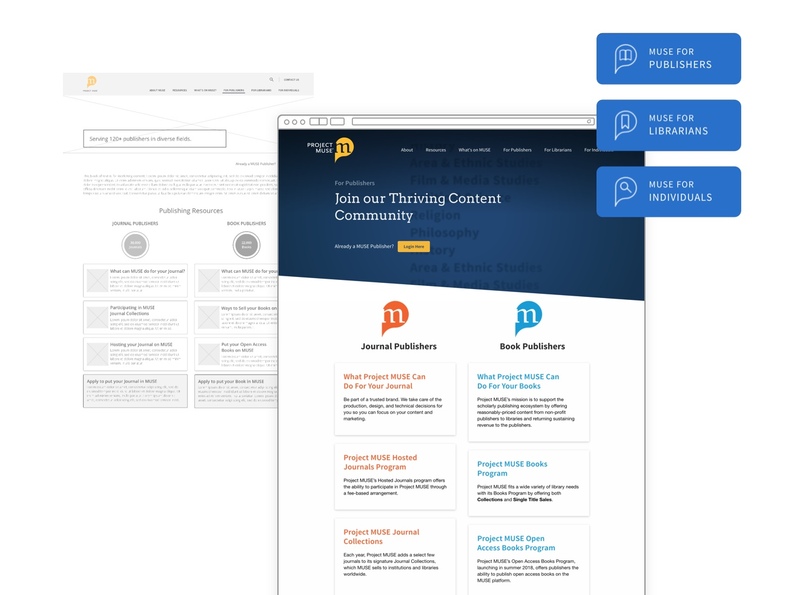 The high volume of content required an audit in order to organize the information in an intuitive and user-friendly structure (e.g., marketing content was separated from the organizational site). 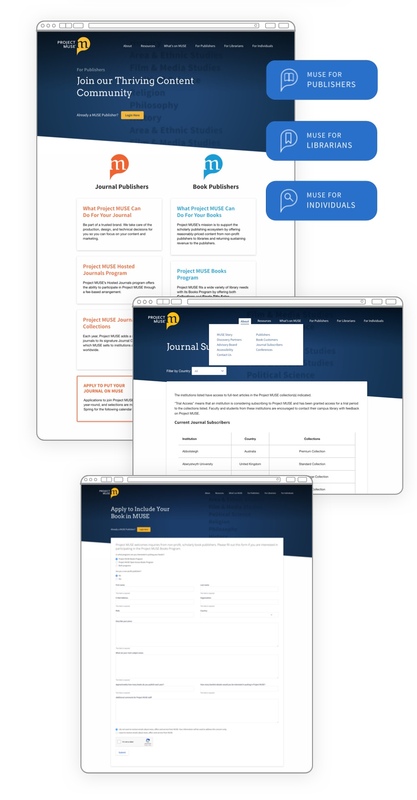 We incorporated a more user-centered focus by creating audience pathways and personalized contact forms catered to each user type. New, modern design templates with UX and development annotations were created to allow Project MUSE engineers to build things out on a responsive, flexible platform. Since the site launched, Project MUSE has received incredibly positive feedback from visitors and staff. Usage has increased significantly: July’s Journal +7.3%, China +56.1%, Canada +7.4%, and Brazil +1300%. Book usage in Australia went up 389% and Canada increased by 34.8%.